In light of the projected increase in the frequency and intensity of disasters associated with climate change, the number of people displaced in the context of disasters will inevitably rise. Existing national, regional and international legal regimes, however, currently respond to only some of the protection concerns arising from such displacement. Crafting an appropriate response will demand a cross-sectoral approach that addresses different forms of human mobility and which also recognises the local knowledge, values and beliefs of affected communities. 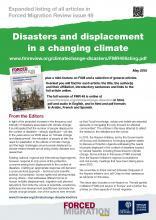 FMR 49 includes 36 articles on ‘Disasters and displacement in a changing climate’, five articles on ‘Female genital mutilation (FGM) and asylum in Europe’, and five ‘general’ articles. This issue of FMR is available online in English in pdf, html and audio formats, and will be available in French, Spanish and Arabic in html and pdf formats. It will be available in print in all four languages. A four-sided expanded contents Listing of all articles in this issue of FMR is also available (pictured right, under the full issue image). This provides for each article: the title, the author(s) and their affiliation, the introductory sentences and a link to the full article online. It is available online and in print in English, French, Spanish and Arabic. 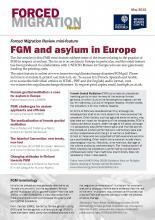 Mini-feature on female genital mutilation – available as separate PDF (pictured right): This FMR mini-feature addresses some of the issues relating to the practice of FGM in respect of asylum. The focus is on asylum in Europe in particular, and this mini-feature has been produced in collaboration with UNHCR’s Bureau for Europe. However, it is obvious – and right – that the implications are applicable beyond the borders of Europe. This 12-page mini-feature is also available (in English) as a stand-alone pdf at www.fmreview.org/climatechange-disasters/FGM.pdf and in French, Spanish and Arabic (click on the appropriate language tab above). We encourage you to use and disseminate it widely. Please note that FMR is published in A5 format (half of A4). In order to print it out properly, please use your printer’s ‘Booklet’ setting. The Listing is A4 format. Please help disseminate this issue as widely as possible by circulating to networks, posting links, mentioning it on Twitter and Facebook and adding it to resources lists. We encourage you to circulate or reproduce any articles in their entirety but please cite: Forced Migration Review issue 49 www.fmreview.org/climatechange-disasters. We would like to thank Hannah Entwisle Chapuisat of the Nansen Initiative and Jeff Crisp for their assistance as advisors on this issue. This issue of Forced Migration Review was made possible through a project funded by the European Union and administered by UNHCR on ‘Climate change and displacement: building an evidence base and equipping States with tools and guidance for action’. The contents of this publication are the sole responsibility of Forced Migration Review and can in no way be taken to reflect the views of the European Union.